The bandits who searching Timmy in Rattay are still standing into each other and don’t talk to me if I chose the way to follow them to Rattay. They are still running to the tavern while I said to them Timmy is at the butcher. And why let the guards still running everyone into their town without stop them at the gate? Started a new save for Band of Bastards. Finished Ginger in a Pickle and then went to see Hans in the castle to start Next to Godliness. He said go there at Dusk (done this many time, I knew the drill). I’m unable to interact with him, he just stands still all day and I can’t complete the side quest. I suppose I could skip it, but won’t that prevent me from doing the Hans Capon DLC? Edit: Reloaded save just before I spoke to Hans, this time he was laid in bed as he should be. Problem solved all is well. Don’t know the relevance, but I got my first pair of leather boots and noticed this bug (invisible boots). My first CTD occurred once I put something else on and exited the menu. I have since had constant CTDs which have made that save unplayable. EDIT: Something that may or may not correlate. (Unclear because after the first crash I fast traveled to complete these quests) The King’s Silver/ All that Glisters quests were completed after the initial CTD. Another person is getting CTDs after trying to pick the quests up. Unkillable dice player in Ledetchko. Unless nor can he be stunned. Isn’t he the one from the Capon DLC? That wouldn’t be a bug - he’s an important NPC. Important person who cant be stunned ? Unkillable ok but the second option ? I have a bug where Runt won’t attack on his own in Baptism of fire. He will only use clinch, riposte and masterstrike. If I don’t attack myself, we will just stare at each other until the end of time. Radzig, Hanush, Capon or the engineer from Skalitz also cannot be stunned and neither can several other NPCs. So I’m new to the KCD world… Do the devs have an average timeframe they typically take to get a hotfix out? Just wondering if some of the veteran players have some insight. These days, hotfixes usually come out just before new DLCs, so there will be quite a wait unless they discover something crucial. I’m currently experiencing no major bugs. I’m in the siege mission, and until installing the last update of the weekend 8 and 9 February, the game was perfect. Now, with this last update, when I charge the game, more or less at the minute of playing, the game is going to the desktop. I tried to uninstall it and reinstall it, but it’s the same. Only response on the matter I have found. I have started the quest “A new Home” but the Book is not where it supposed to be on its book stand. I also cant build anything. If i want to build something the Locator says: " Thats not possible, look in the Book there is what you need to do." 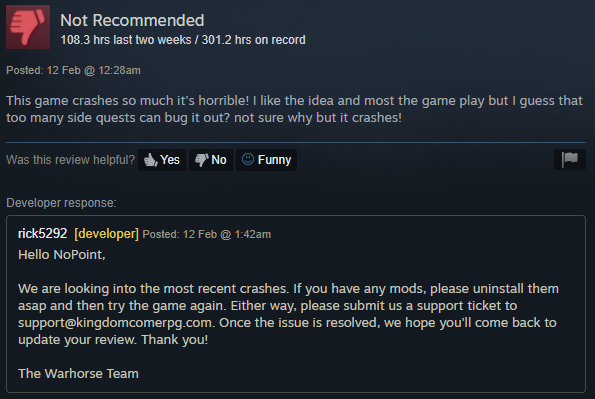 I have tried older Savegames and to repair over steam. This, unfortunately is a wide-spread bug (although I was able to steal mine from the locked chest). The devs said they know about it, so there’s hope. 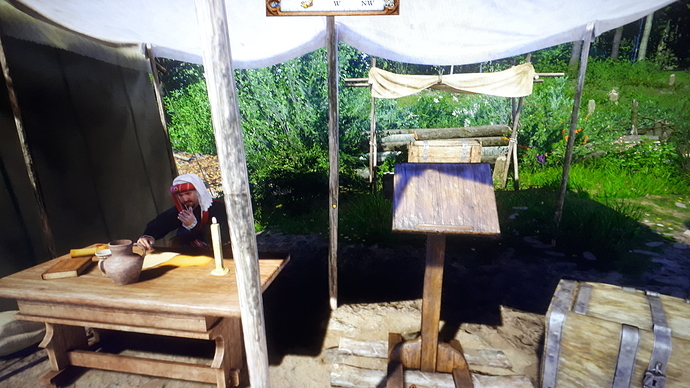 Pribyslavitz, no one is playing Dice at the Tavern. Fully upgraded town with various NPCs invited to live and work and no one wants to throw some dice with me. I had an issue recently with the Robber Baron quest. All the bandits glitched out and stood in place unable to move around, the only one who could move was the leader. The guards killed them all as I waited for it finish. I was really hoping for a good fight. I was going to start new game with all the dlc however now iam experiencing the no sound in game. Try every fix posted nothing helped. have latest version of game with all DLC cant have sound in game like nothing at all. On scenes that we are supposed to be talking with other people chars have no lip movements on top of no sound . No idea how to fix it every post about sound fix i have try and nothing.